If you’re searching for the best subwoofer under $200? You have a difficult decision to make. There are a plethora of excellent quality subwoofers available on the market at very reasonable prices. Each and every one has its own unique qualities. This is the reason why we’ve decided to put together a list of five of the latest and best home subwoofers under $200. Looking to make an impression on your neighbors? Either way, we've got the best powered subwoofer under $200 for you for all your crazy needs. 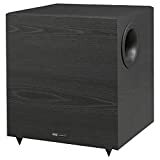 We have considered few factors [mentioned below the list] while putting together this list of what are the best cheap subwoofers available right now. Please have a read before making a commitment. This subwoofer combines perfectly with your speakers for a bass that is life like. It is also well designed with practicality in mind. The wide vent reduces turbulence and distortion ensuring your bass sound is thundering but precise. The unit is solidly built with a front baffle that is 1 inch thick. This helps to reduce distortion and suppresses the enclosure panel resonance, making the response as accurate as it can be. The subwoofer comes equipped with sturdy feet, which stops its awesome power from sliding the unit across the floor; when used at higher volumes. Better linearity is achieved by the 12 inch long throw driver, which allows for longer excursion. The low pass crossover is adjustable, and combined with its volume control and phase switch ensures that the sub is linked perfectly with any speaker system. An auto on/off function will turn on the subwoofer as soon as it senses a signal. If there is no signal present, the subwoofer will automatically shut down within 15 minutes. "Polk Audio PSW505 is an excellent subwoofer that is the cheapest in the list in terms of price and close to $100 price, if you just want to get started with a subwoofer, this should be your first one." For a subwoofer priced under $200, the V-1220 gives you an excellent performance. The amplifier runs at 200 watts with a peak of 430 watts, which is combined with butyl surround and a 12” long-throw heavy duty woofer. With 86dB sensitivity you’ll get powerful sound, this is an ideal model for those seeking a deep bass. This subwoofer features the ‘Venturi’ vent which gets rid of port noise that can sometimes be a feature with subwoofers, especially when playing a bit more demanding videos or music. This model also has a crossover which is adjustable, Dolby Pro Logic and Dolby Digital inputs, as well as high level inputs. It also features automatic signal sensing, turning the unit on or off when an input is detected. You’ll find that the BIC America V-1220 comes with a polypropylene woofer cone, featuring rubber surround material which ensures distortion is kept to a minimum and the 8-ohm impedance means that power is conducted through the speakers. Its appearance is stylish, it sits in a high-grain wood frame and is finished in a black laminate. The construction as a whole gives a feel of a higher end product, giving you the impression that the unit should have cost you more. As with most speaker systems, this unit will require a period of breaking in at a higher level before being adjusted to your ideal volume. The unit weighs 41lbs and has dimensions of 18.5”H x 17”W x 14”D. "Bic America, though not a popular name in Audio Equipment, is a premium brand with sought after subwoofers under its name. If you're thirsty for a loud subwoofer under budget, this one fits the bill perfectly." If you are looking for the best cheap 10-inch subwoofer; then this front-firing model is a very powerful contender. This speaker gives you the deep bass you crave alongside full placement flexibility... thanks to an all-digital amplifier and a front firing driver. People will be able to feel this subwoofer wherever they sit in your room; thanks to its wide dispersion pattern. The featured driver is lightweight and gives unrivalled low bass, making it an ideal choice for home theatre system. Just because it is lightweight, doesn’t mean that this unit is flimsy in any way. The Klipsch K100SW is very rigid and gives you amazing low-frequency responses with very little distortion and minimal cone break up. Ample power is easily delivered by the all digital amplifier which is built into the unit, making it highly efficient and reproducing sources with startling clarity. The OW pass crossover and phase control gives you the opportunity to blend the low frequency tones put out by the unit with your other speakers, as well as giving you easy control over the level of bass. A variation of inputs (Line/LFE) makes sure that the K100SW is backward and forward compatible with receivers that are old or new. The finish is elegant and will complement the aesthetics in any room. The grille is strong and flexible, but also removable giving you the look you’re most comfortable with. An LED power indicator is featured on the front of the unit, letting you know when it is on or off. "Klipsch is a very popular brand for critical-listening based audio equipments and same is the case with its subwoofer. This is a professional subwoofer available at a very cheap price and steal for you." The first thing you’ll notice about this subwoofer is that the shape is very different compared to the others we have reviewed up to this point. This new shape unit features a lot of the latest technologies that have recently been developed by Yamaha. This includes a linear port, which in incorporated into the down firing design which helps to produce a clean sounding and distortion free bass sound that will complement your favorite music and movies in an obvious way. The Advanced Yamaha Active Servo Technology (Advanced YST for short), is a system that is unique to Yamaha’s speakers and ensures that speakers and amps cancel out impedance by working together to make sure units have a linear motion that is as close to perfect as can be. This means this unit can handle the highest levels of sound pressure, bringing you the best overall performance it can. When you have a beautiful, sleek surround sound system fitted into your house, often the subwoofer lets the overall aesthetics down by being an obtrusive chunky box on the floor. The Yamaha YST-FSW050 will fit neatly on a shelf or rack below the sound system itself. Despite its diminutive size; this down firing unit will deliver high quality bass to everyone in the room, regardless of where they are sitting. The design ensures that sound is radiated in all directions equally. "If you're short on space and in dire need of a compact subwoofer, you know where to look now." The second Polk unit to feature on our list is the smaller 8 inch model, the PSW111. This subwoofer is a great match for a sound bar system or compact speakers and is compatible with a wide range of systems. This Polk Audio PSW111 may be small, but it packs a powerful punch and its diminutive size means it can be placed almost anywhere. Users of this subwoofer agree that the bass sound has to be heard before you believe it is coming from such a small unit. As with most Polk Audio subwoofers, this model features a downward firing port. In this way the bass impact is maximized whilst ensuring that the front of the cabinet is kept as low as possible. The unit has been manufactured using a Klippel Distortion Analyser, which means the unit’s motor structure has been optimised, along with the voice call alignment and the suspension. This guarantees you the best performance, even when used at more extreme levels. Polk engineers bring you pure sounding, distortion free sound by tuning out resonance. This a result of using the right mix of materials in the manufacture of the unit, as well as giving consideration to geometry and the techniques used in construction. This subwoofer makes connection to any system as easy as possible with multiple hook up options. These include LFE and line speaker inputs. Polk subwoofers also feature intelligent amplifiers, ensuring that the minimum power is used at low volumes and in standby mode. "The Polk Audio PSW111 is the holy grail of subwoofer that is under budget and costs under $200. If you want an all-rounder performing subwoofer, here you have it." Using multiple subwoofers can give you more bass response in a room than you will get with just one. When using a number of subwoofers remember that the overall system performance is key and not the performance of an individual sub. Note that every time you double the number of subwoofers in your system you are increasing output by 6 dB. This means that each subwoofer is working less hard to produce a level of volume, less strain on a subwoofer means they will last longer. If you only have the space for one subwoofer then ensure you get the best one you can afford. Amplification is built in to a powered subwoofer whereas if you opt for a passive one; it will need to be amplified externally. The majority of subwoofers you will find on the market are going to be powered. Powered subs will normally come with built in controls which help to blend it with the speaker system, ensuring you have purchased the best $200 speakers you can afford will help with this. Professional audio systems will be far more likely to use standalone passive subwoofers, you will mostly find powered sub woofers available for home use. Basic subwoofers will typically only give you one line-level output and may have limited controls such as lowpass filter and volume. The more advanced the subwoofer the more control you are likely to have over the output. These could include variable phase control, highness outputs and stereo inputs. If you are able to afford the top of the range then you should expect these models to feature noise rejecting XLR connections and for performance not to be adversely affected by long cable runs. What are you going to be using the subwoofer for? Is it going to be primarily for use with a home entertainment system or are you going to be using it solely for music? Music is actually less demanding than a movie as the latter tends to challenge the subwoofer to the deepest bass frequencies. If home cinema is your thing then consider prioritising the bass extension and output over the aesthetics of the system. The best home theatre subwoofer under $200 will be good enough to produce a big difference in the sound of your home movie nights. ...but if music is your love then a compact sealed subwoofer could be all you need to improve the performance of your bookshelf speakers. Buying a speaker system for your audio needs or for a home cinema system can be a daunting prospect. These systems can cost an eye-watering amount of money and you want to ensure that you get it right first time. Fortunately when it comes to the purchase of a decent subwoofer; it needn’t cost you the earth to ensure you get a quality product. The five subs featured above are of the best quality and come highly recommended by users. 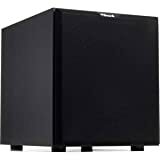 Picking a subwoofer that is going to give you superb, clear sound, be of a superior build quality and aesthetically pleasing in your home shouldn’t cost you more than $200. If you choose from one of the list recommended above, it won’t.